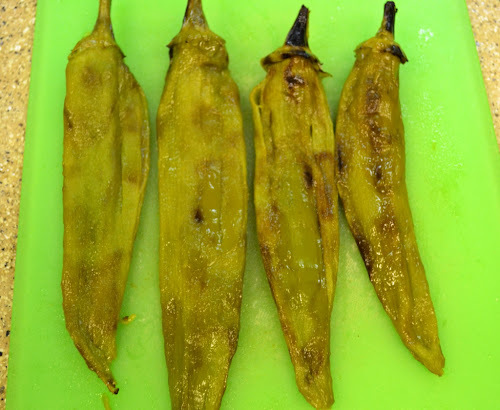 As southwestern transplants, it's important we know our way around chilies! Of course, you can buy green chilies in little cans, but they are pricey, or you can buy them fresh in the produce section of your grocery store, or grow your own! They taste so much better when you roast them yourself! Last year I bought a beautiful "Anaheim" chili plant, or so I thought . . . turns out it was a standard green bell pepper plant. 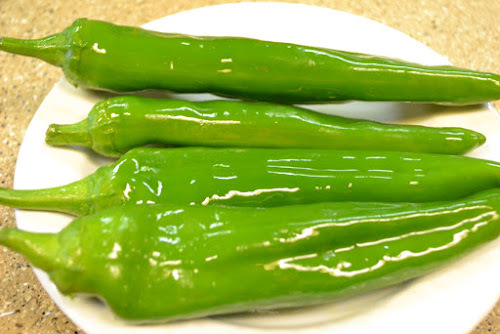 While I'm not a big fan of green peppers, they are a must in Cajun foods, so they won't go to waste. This year I made sure I could see a little chili on the Anaheim plant(s) before I bought it. The pot had 3 plants in it. I planted 2 together, but was able to separate 1 from the others. This is my very first crop of home grown Anaheims and I am very excited about the prospect of roasting and using my own in so many dishes! 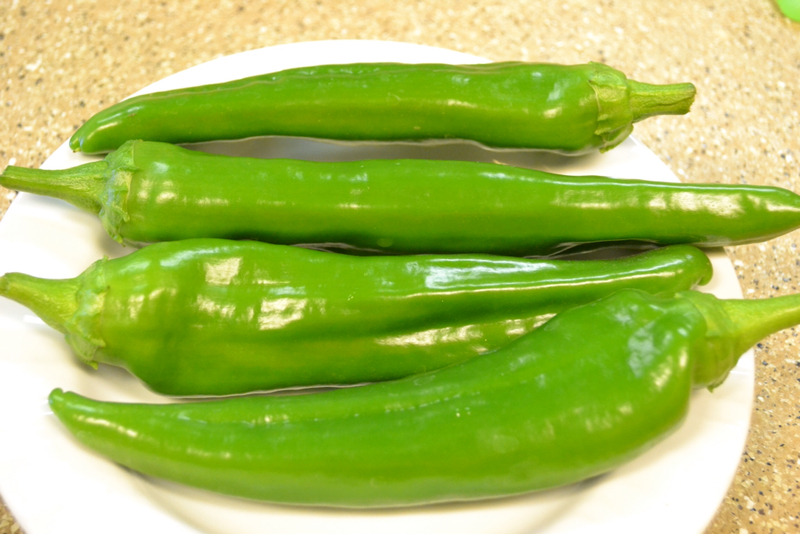 Freshly picked from our winter garden ~ Anaheim Chilies! 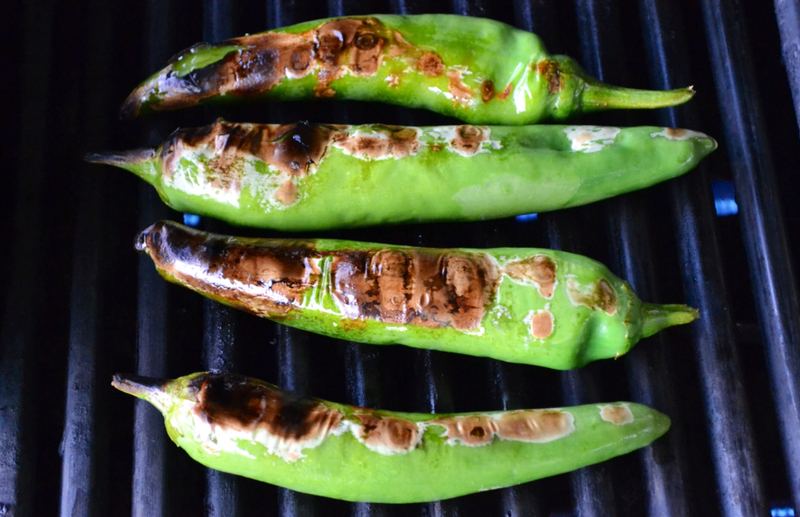 "I love roasting green Anaheim chilies on the grill! I fire up the gas grill, adding mesquite wood for smokiness. 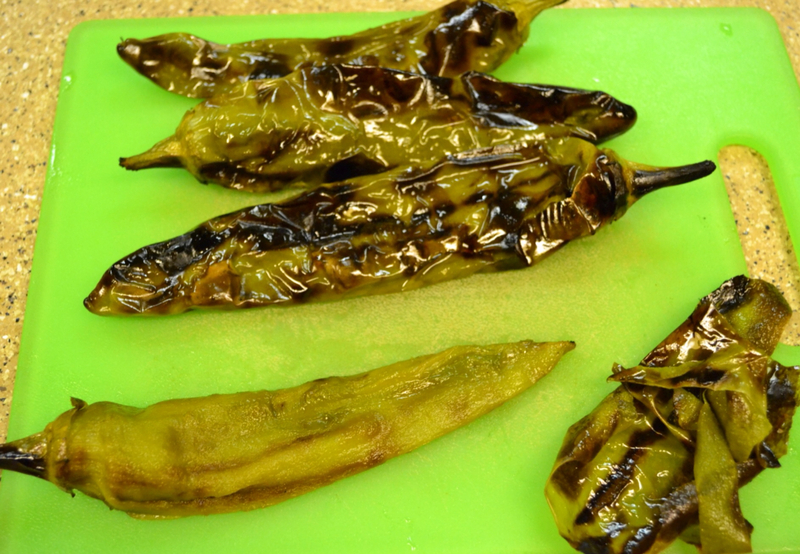 After washing chilies, I prepare them for the grill by coating with olive oil. Make sure it is a good coating because this will keep the outside from crisping on the grill. Keeping the grill on high, I place the these hot bandits cross ways so I can roll them easily for turning. Turn the chilies after 3 minutes or so. The easy way to tell when they're ready to turn, is the top surface will start to cave in a bit. The bottom needs to be black and blistered before turning. A good blistering all around, will insure the skin comes off easily. After the chilies are cooked, they are placed in a bowl and covered with plastic wrap to let them sweat. This step insures the outer skin comes off easily, and allows them time to cool before peeling the outside skin off." Drizzle with olive oil and massage peppers to thoroughly coat them. Perfectly roasted! Tender inside with outer skin blistered. 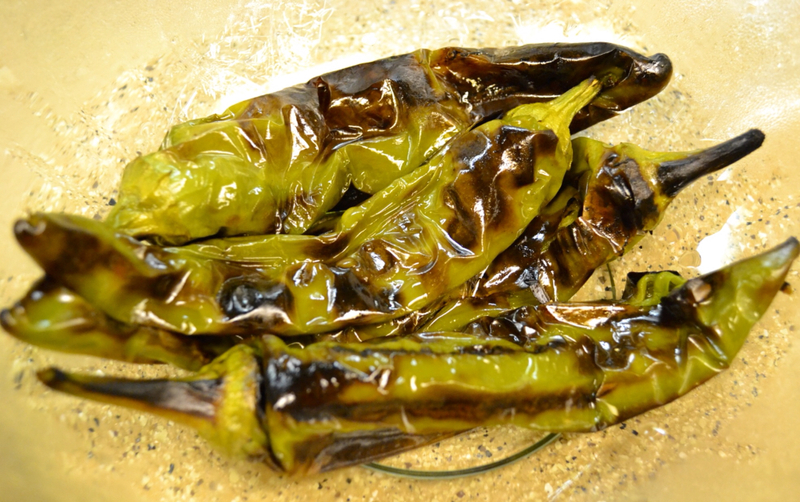 Letting chilies steam to loosen the tough outer skin. Cooled and ready to peel! When chilies are properly roasted the skins come off easily. Pull the stem off and you are ready to use your Roasted Anaheim Chilies! 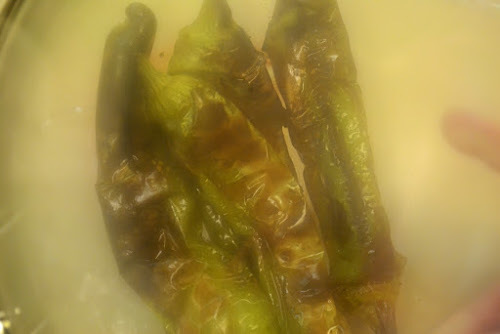 So, some of you might be wondering, "What do you use green chilies in?" The answer? You are limited only by your imagination! Whether you use them sliced, diced, or whole . . . They are great in: Scrambled eggs, green corn tamales, quesadillas, burritos, tacos, fajitas, crock pot pork shoulder with green chili gravy, chicken enchiladas, green chili nacho cheese dip, on top of a burger with melted Monterey Jack cheese, on top of a rib eye steak with onions and mushrooms, baked chicken with mushroom and green chili gravy, corn bread . . . Etc. etc. etc. 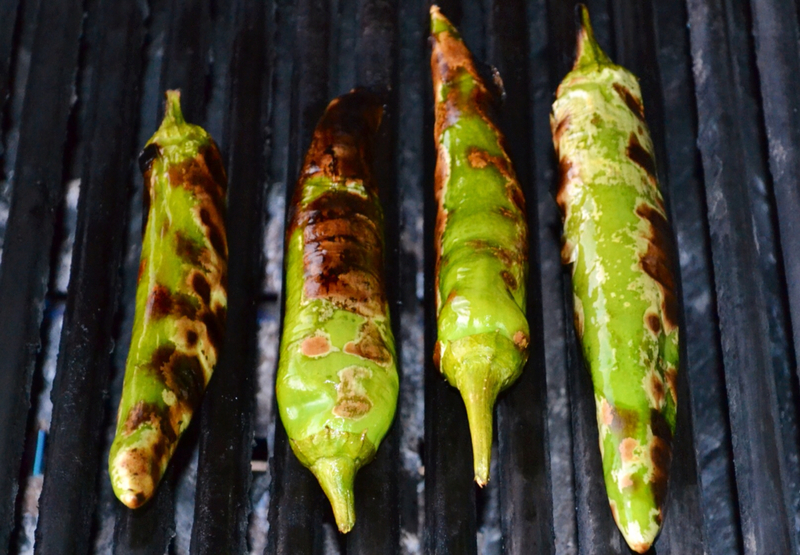 Easy to grow, fun to roast and tasty in so many wonderful dishes! They also freeze nicely! The Anaheim is a mild chili packed with flavor. 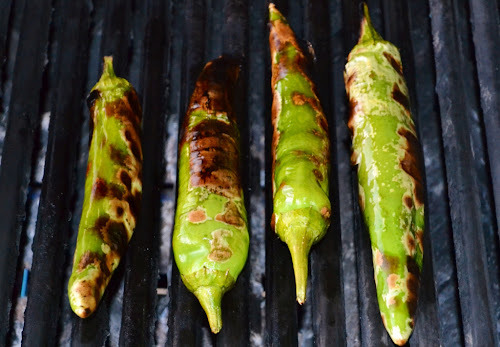 It's one of my favorite chilies to use in Mexican dishes . . . Over at Julie's!! !